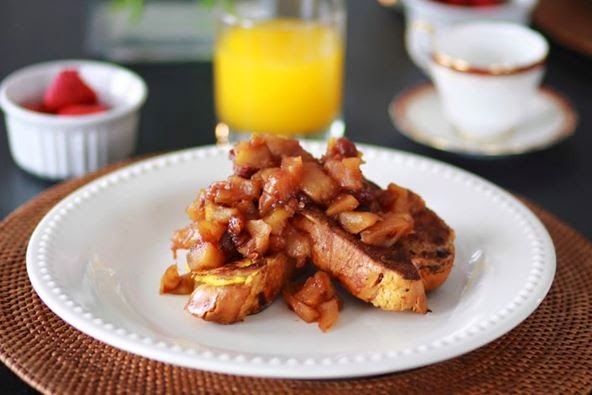 Dress up your basic French toast recipe with this hearty apple chutney! This is an easy recipe that won't have you slaving in the kitchen for hours. In a large saucepan, combine apples, raisins, brown sugar, wine, lemon zest and lemon juice. Place over medium heat until the brown sugar dissolves. Cover and reduce the heat to low until the apples become tender. Remove from heat and set aside to cool. In a medium bowl, beat eggs with a fork until blended. Melt butter in a large frying pan over medium heat. Immerse the brioche slices in the egg mixture and place in the hot pan. Cook until golden brown on the bottom, about 4 minutes. Turn them over and continue to cook for another 4 minutes. Transfer brioche slices to a plate and top with apple chutney. Sift confectioners' sugar over the french toast for added garnish (optional).